PLEASE BE CAREFUL!! This Spider's bite is dangerous and can have permanent and highly negative consequences. Subject: Fw: PLEASE BE CAREFUL!! This Spider's bite is dangerous and can have permanent and highly negative consequences. WARNING EVERYONE IN U.S.A.!! 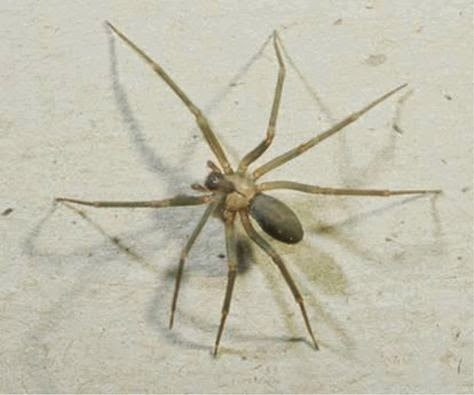 Brown Recluse Spider....It's very small, but very deadly! And, at this time of year they're most active. THIS IS WORTH SEEING!! Show this picture to your spouse, your kids, grand kids, and friends. It could save their lives! --Be careful where you put your hands. --They like cool areas in the attic. --The tend to live in storage sheds or attics or other areas that might not be frequented by people or light. --They also like your shoes & clothes that's been hanging/stored for a while. SHAKE THEM out. NOTE: If you have a need to be in your attic, go up and turn on a light and leave it on for about 30 minutes before you go in to do your work. PLEASE BE CAREFUL!! This Spider's bite is dangerous and can have permanent and highly negative consequences. I personally know people who've almost lost limbs from this spider & one who died. PLEASE WARN EVERYONE! !